North Carolina’s Triangle area has cultivated a foodie paradise of sustainable farms, growers’ markets and seasonal cuisine. But there’s a gap in the local food chain: Low-income households often lack fresh, healthy produce. And nearly one in five residents statewide sometimes go hungry, according to the U.S. Department of Agriculture. Farmer Foodshare buys produce from local farmers and delivers it to food organizations that provide groceries and meals to those in need. Bell’s interest in fresh local food sprouted when she was an undergraduate. 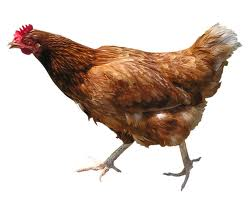 She read up on environmental and health concerns associated with commodity farming and junk-food diets. 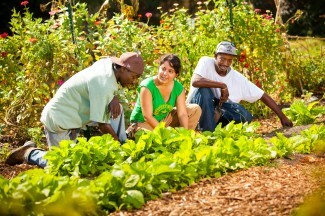 She explored alternatives, including the student-run community vegetable garden on campus. After graduating from UNC, she took courses on sustainable farming and food justice at Central Carolina Community College in Pittsboro. She worked with two local food-shed pioneers: farmer Ken Dawson, who co-founded Maple Spring Gardens in 1972, and Lex Alexander, who in 1981 co-founded Durham’s Wellspring Grocery, now part of the Whole Foods Market chain. The critical thinking skills Bell honed at Carolina kept her digging for solutions. She found bold initiatives sprouting at Farmer Foodshare. The nonprofit was established in 2009 by Margaret Gifford, a shopper at the Carrboro Farmers’ Market who began gathering surplus food from growers and donating it to local food banks. Soon Gifford realized she could collect contributions from other shoppers to pay the farmers for their food. That effort evolved into the unique model that now partners with a network of local farms and food agencies across the region to take a whole-systems approach to food access. Bell started working for Farmer Foodshare in January 2013 and became executive director a year and a half later. In 2015, Farmer Foodshare spent over $182,000 on local food purchases and donated 60,000 pounds of fresh produce from more than 300 farms, supplementing more than 600,000 meals for some 20,000 hungry adults and children. “It’s a joy to find innovative ways to address big issues by tapping into the strengths of so many smart people working together across our community,” she said. Donation Stations: Volunteers collect cash contributions at farmers markets and use the funds to purchase food from the growers. Last year, donation stations at 31 farmers markets provided food to about three dozen community programs. POP (Pennies on the Pound) Market: To respond to increasing demand, Farmer Foodshare created a centralized hub to buy fresh food in bulk. Each week, farmers list what they have available, and about 36 food relief organizations place orders. A Farmer Foodshare van transports the produce from the farms to the warehouse for filling orders. Food Ambassadors: Farmer Foodshare volunteers give cooking demonstrations at markets, food agencies and other locations to show consumers how to prepare produce in new ways or cook with unfamiliar vegetables. –Reprinted from Carolina Arts & Sciences magazine, published by UNC-Chapel Hill’s College of Arts and Sciences. North Carolina ‘s widely recognized real-food scene is cultivated by hundreds of innovative chefs, farmers, advocates and entrepreneurs. A recent story in The New York Times noted that so many are women. Got that right. 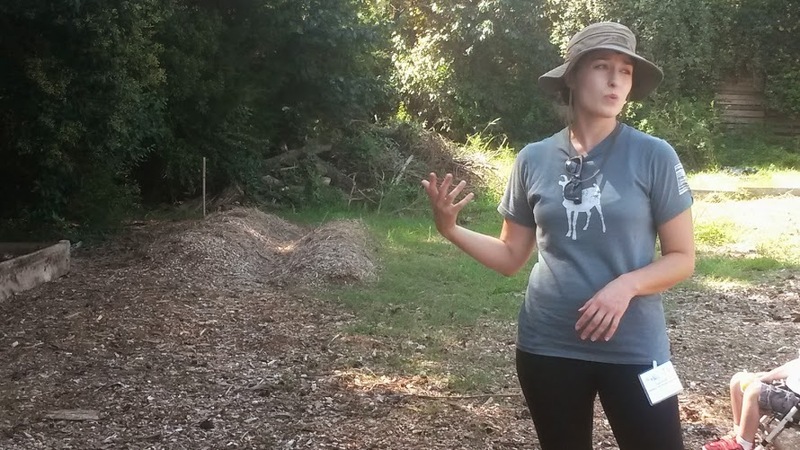 Turns out women lead in “every single link in the food chain in North Carolina,” said Margaret Gifford, who spent 16 years in the state and founded the nonprofit Farmer Foodshare (now directed by Gini Bell). The Times feature cited amazing chefs including Andrea Reusing (Lantern), Ashley Christensen (Poole’s Downtown Diner and more), Katie Button (Asheville’s Curate and Nightbell), and Vivian Howard (Kinston’s Chef and the Farmer, and the PBS Show A Chef’s Life). Other leaders include food studies professor Marcie Cohen Ferris (UNC), innovative pickler April McGreger (Farmer’s Daughter), baker Phoebe Lawless (Scratch), pork producer Eliza MacLean (Cane Creek Farm), meat distributor Jennifer Curtis (Firsthand Foods) and millers Jennifer Lapidus and Kim Thompson (Carolina Ground). In our Pittsboro foodshed alone, we admire Debbie Roos, our sustainable agricultural extension agent and pollinator garden propagator. Also Slow Money NC co-founder Carol Hewitt, Abundance NC director Tami Schwerin, sustainable ag community college director Robin Kohanowich, Greek restaurateur Angelina Koulizakis-Bashista and a long list of female farmers, co-op leaders, food bank operators, and farmers’ market managers. Yow. Men working in the food shed told The Times that it’s not surprising that women are leading the way. 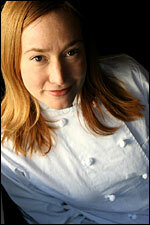 “For me, it’s as simple as the cream rises to the top,” said Chef Tandy Wilson (City House). US Senate Majority Leader Harry Reid (D-NV) proposed a fiscal package last week that would correct the devastating cuts made to local food and organic agriculture in the “fiscal cliff” deal passed by Congress last month. The proposal would end direct payments for subsidies and restore the programs for renewable energy, rural small businesses, value-added agriculture, new and beginning farmers, conservation, specialty crops, organic farming, minority farmers, and local food producers that were left out of the farm bill extension portion of the fiscal cliff deal. The cost of those programs combined paled in comparison to the $5 billion price attached to the direct payment program. The Reid proposal would right that wrong and it would also provide immediate funding for livestock disaster assistance, which was also left out when the farm bill was thrown over the cliff earlier. 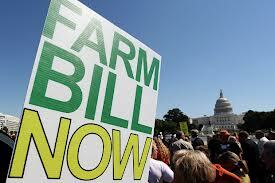 The Reid proposal would cut defense spending and net farm bill spending by $27.5 billion each over the next decade. The proposal saves the federal government $31 billion in direct commodity production subsidies, while reinvesting $3.5 million to pay for a full farm bill extension, including the programs not included in the fiscal cliff extension. One of the programs not included in the fiscal cliff farm bill extension provided cost share funds to growers to become certified organic. That program distributed almost $60,000 to NC growers in 2012. Another program not included in the extension provided funding for an organic grain-breeding program at NC State University. This program provided badly needed support to the growing NC organic grain industry through research on organic crop production and pest management. Check out this TEDx talk by Stacy Mitchell, senior researcher with the Institute for Local Self-Reliance. She says buying local is a great idea, but it’s only the first step in changing the world. We know that small sustainable farms produce more than twice as much food per acre as big farms, with far less environmental impact. But Walmart continues to capture one in four food dollars in America — and half the market in some three dozen metro areas — not because its food is better (clearly, it’s not), but because it can use its giant market power to influence politics, and the business and tax policies affecting food. It will take collective action by citizens demanding new policies — including a wholly new Farm Bill — to reform our economy for the better. That’s an audacious goal, one worth working toward, while we continue to build a sustainable foodshed for our community. “The primary and often exclusive way we think about our agency in the world now is as consumers. But as consumers we’re very weak. We’re operating as lone individuals, making a series of small decisions, and the most we can do is pick between the options that are presented to us….we’re hoping that someday enough of us will have enough information about all the issues and all the choices in the marketplace, and we’ll have access to all the right alternatives, and all or most of us will be able to make the right decisions all or most of the time. But while we’re trying to line up all of these millions of small decisions in the right direction, we are swimming upstream against a powerful down current of public policies that are taking our economy in exactly the opposite direction. UPDATE: Supper tickets to this are sold out, but you can still attend, drink some brew and make a $10 donation to support the cause. Friends, this is a no brainer. I love eating seasonal food raised on local farms. Especially when it’s served in a local eatery. I’ve been dying for a quench of that new Cackalacky Ginger Pale Ale at FullSteam in Durham. And who wouldn’t want to chip in to support new community-based funds for newbie local farms and food enterprises, through great local orgs like Slow Money NC, the Abundance Foundation and Carolina Farm Stewardship Association? Looks like I’ll get to do all of this and more by plunking down $15 at FullSteam Brewery, Jan. 27 at 7 pm. A little extra for the brew. 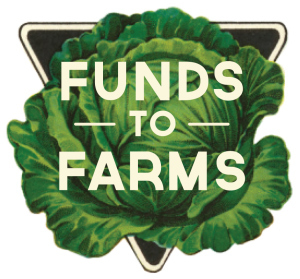 What a deal, all part of a new dinner series called Funds to Farms. And you can join in the fun. Here’s how it works. The first Funds to Farms event will be a buffet style, sit-down meal featuring soup (veggie & meat) donated by Vin Rouge Bistro. Attendees will have the first half hour to get their food and drinks and make it to a table.Bon appetit. Then, five local beginning farmers and food entrepreneurs will each pitch a project for which they need our funding, i.e. the dough-re-mi we gave at the door, and some of the brew proceeds, too. After all of the presentations, attendees (that’s us) will vote on which project we would like to fund. The winner gets the proceeds from the evening and promises to attend the next Funds to Farms event to give a progress report. Tickets are available online and at FullSteam on the day of the event.